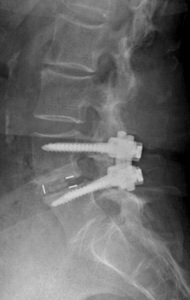 Transforaminal Lumbar Interbody Fusion: A fusion entails one vertebral	body (ex. L4) fusing to another (ex. L5). This provides stability and	decreases pain from the facet joints and disc (ex. L4-5) in between the	vertebral bodies. The TLIF is a fusion that approaches the spine from	the back (posterior), removes a facet joint in order to get access to	the disc space thru the foramen (hence “transforaminal”). The disc is removed and replaced with a spacer (typically plastic) and	bone graft (or substitute such as BMP). The spacer provides stability,	increases the disc height in order to restore alignment, and increases	the chance of successful fusion. Pedicle screws are inserted into the	bone in order to stabilize the motion segment (ex. L4-5) and increase	fusion rate. We insert our pedicle screws under three-dimensional computer	navigation which increases the accuracy and safety of the procedure. Ninety-five	percent of our patients have had pain reduction with a TLIF procedure	with an average pain reduction from pre-op 9/10 to 2/10 post-op. Here is an example of a patient who underwent a TLIF. 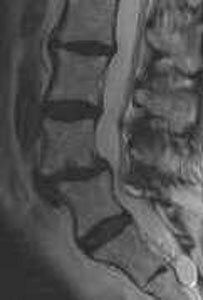 She was suffering	from back and mainly left leg pain due to spondylolisthesis at L4-L5. She failed conservative management in the form of physical therapy, activity	modification, and oral medications. Her pre-op pain was a 9/10. She underwent	the TLIF procedure uneventfully and at only two weeks after the procedure	her pain is decreased from her pre-op pain. Figure 2. Pre-op MRI showing severe stenosis due to the slip of L4 forward on L5. Figure 3. 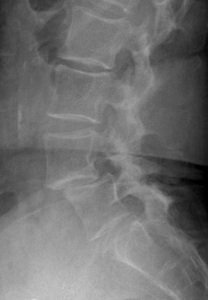 Post-op lateral x-ray showing PEEK spacer increased disc height,	restored lordosis (normal curvature) and reduced slip of L4 on L5, thereby	relieving stenosis. Additionally, pedicle screws provide stability to	increase fusion success.